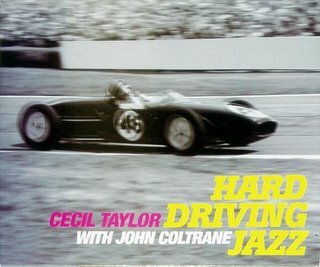 This CD issue of several of Taylor's late 1950s sessions includes not only the music that made up the original release under Taylor's name (also issued later by Blue Note as 'Coltrane Time') but also goes the extra mile by including music from two other late 50s sessions featuring the misunderstood piano genius. This is actually a great place to sample Taylor for the first time if you haven't already done so - his playing - particularly his comping behind the soloists - is a little less angular than it would become, the atonality a little less pronounced. Some have even gone as far as to compare his playing on this date to that of Thelonius Monk - a pretty accurate reading of it, in my view. In fact in many ways the original 1958 session is straightforward hard-bop. That's certainly what everyone else plays, anyway. Coltrane is on good but unspectacular form - this would be recorded at pretty much the height of his heroin addiction, so getting any performance out of him at all would have been a success. Dorham, a straight-down-the-middle trumpeter, does exactly what you'd expect, and the rhythm section do what's expected of them and no more. Having said that, there's an exuberance about these early tracks that charms the listener. Perhaps it's just that they were all having a great time laying down some music. Maybe they were getting paid well (!). Or maybe it's got something to do with Taylor's bold approach to the piano. It sounds a little tame now, but at the time critics and audiences alike couldn't believe what he was playing - they thought he couldn't play, but this is not the sort of untutored banging away that my 2 1/2 year old son would produce if let loose with a piano. Taylor's been listening, and seems to pick the least obvious notes and chords, but they still fit harmonically. Being able to think outside of the norm and then being brave enough to go on and play it on record shows great skill and tenacity. The other sessions on the CD are interesting too. Steve Lacy is always good to listen to, and it's interesting to hear him at the transition in his career - prior to playing with Taylor he was a noted dixieland player! Buell Neidlinger also crops up with some typically excellent bass playing, though his partnership with Taylor is not as well-formed as it would become on the Candid recordings of 1960-61.